Great science fiction frequently uses extrapolation or invention to show us new possibilities for humanity, but also, where possible, teaches us something about the world in which we live and the dangers inherent in our own certainties and mindsets. From HG Wells’ War of the Worlds and its commentary on the way the technologically advanced treated those less equipped than themselves, to Michael Crichton’s Jurassic Park with its warnings about the unpredictability of nature and our hubris in thinking we can account for its variables, science fiction has often sounded a warning not about the elements of new development as such, but about the way we use them to improve or denigrate the world and our shared experience of it. Welcome to The War Machines, the Doctor Who story that forecast the invention of the internet, and extrapolated that machines might do the sums of supremacy, and find their creators wanting, opting instead to exterminate us and take on themselves the burden for the future progress of ‘life’ on Earth. WOTAN (with a V) is the ultimate supercomputer, able to link with any other computer around the world, enslaves the minds of some handy humans and builds itself a bunch of trundling Dalek-wannabe tanks, with which to subdue first London, then cities around the world. The rise of the machines is pretty much assured – unless the Doctor can save us. On screen, The War Machines was a bit of a breakthrough – it marked the first time the Tardis had been back to what was then ‘contemporary’ London for a full adventure since disappearing at the end of An Unearthly Child, and the first real time that the threats of monsters had been brought right home too. It engaged with current events – the building of the Post Office Tower in particular – and before the Cybermen marched down the steps of St Pauls, before there were Yeti in the Underground or exile by the Time Lords or the arrival of Brigadier Lethbridge-Stewart, it forced the First Doctor to confront an evil on the streets of the British capital city, in the here and now or thereabouts of the audience. It made a bold statement to that audience – it’s all very well for the universe to be a dangerous place, but you live in the universe too, and danger can be anywhere, even where you live. It also, of course, wrote out the Doctor’s travelling companion, Dodo, with scandalously indecent haste – she more or less wandered off in the middle of the story and was never seen again, and the Doctor just took off at the end of the story without her. And it introduced us to a new couple of contemporary Earthling companions, Polly and Ben, who proved their mettle in the fight against the War Machines and would go on to experience the oddest secret of the Time Lord when the Doctor regenerated in The Tenth Planet. 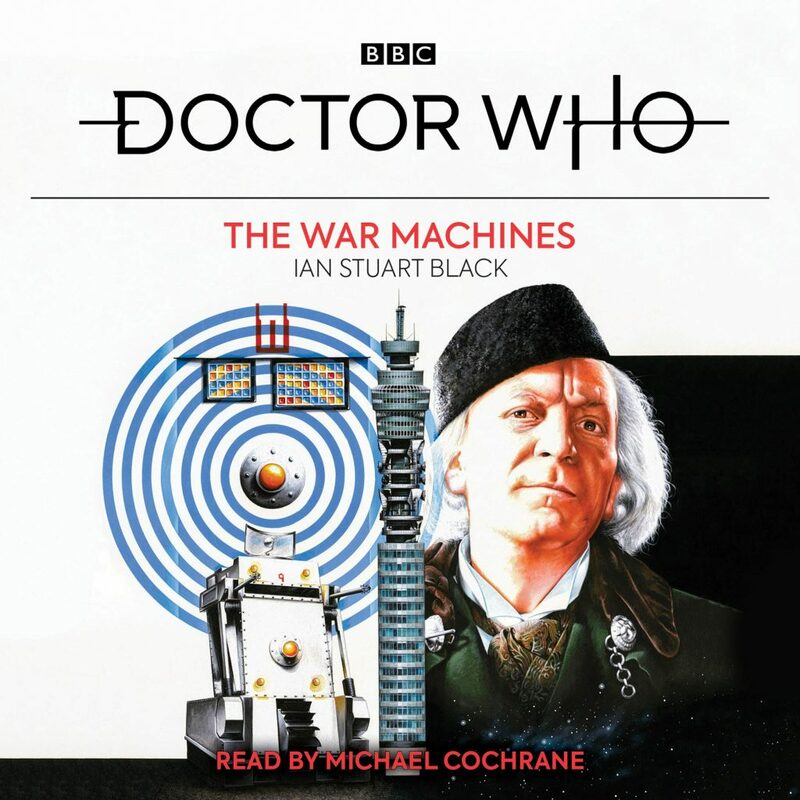 It’s taken a while for novelization of The War Machines to come to audio, but now it’s here, it’s absolutely worth a listen, because it does everything the TV version does successfully, but retcons tiny moments that have always had the potential to set the viewer’s teeth on edge. In particular, that business with Dodo just wandering off to have a rest halfway through and never coming back – Ian Stuart Black treats that very much better in the novel, with both Dodo and the Doctor sensing from the minute they arrive in contemporary London that this marks the end of their travels together. That while it’s been fun, Dodo’s home now, and is done with the ‘universal traveller’ phase of her life. They never overtly admit it to each other, but Ian Stuart Black allows us inside their minds to understand this realisation, which means when Dodo disappears, it doesn’t jar in the audiobook the way it did on screen. There’s a satisfying, if somewhat temporally implausible, explanation for how and why the Doctor is a) allowed to hob-nob with the scientists at the heart of the biggest computer project in the history of mankind, and b) known by WOTAN as a vital resource that is required to help it with its masterplan for conquest of the planet and the extermination of the tedious fleshy humans cluttering up the place. No, we’re not going to spoil that for you – you want some surprises left intact, don’t you? There’s more of a sense of odd, machine-code individuality about one of the leading War Machines too, leading to an understanding of the programme at the heart of it all – we hear several of WOTAN’s humans declare that when their task is accomplished, their usefulness will be at an end and they will be destroyed. The same, it seems, is true of the War Machines themselves – and as we’re on the iPhone X and the Samsung S10, this idea of computers improving and expanding their functionality in iterations is something with which we’re familiar, fifty years after The War Machines trundled across our screens, so the added details of these elements in the audiobook feel inherently right. Oh and then there’s the name. Famously, when it cottons on to the Doctor’s potential usefulness, WOTAN declares on screen that ‘Doc-torrr Whooo is re-quiiired’ – making fans of a certain generation cringe, irrespective of the Moffat-era rehabilitation for calling the character ‘Doctor Who’ within the storylines of the show. Let me just say no, hell no, no some more, and no to the horse you rode in on too. Ian Stuart Black, bless his heart, retcons that moment, so now ‘The Doc-torrrr’ is required, thank you very much. Full marks, Ian Stuart Black, for improving on an otherwise top-notch story. Reading duties here go to Michael Cochrane, perhaps not the most natural choice in the world, but he does rather well, giving a reasonably breathy Hartnell and differentiating between several characters in the story who could otherwise sound very similar, being men of a similar age and standing. His Ben and Polly too, while being in no sense impressions of the pair, are suitably broad-brush emotional representations to let you ‘get’ them as you’re swept up in the fight for the organic future of humanity.